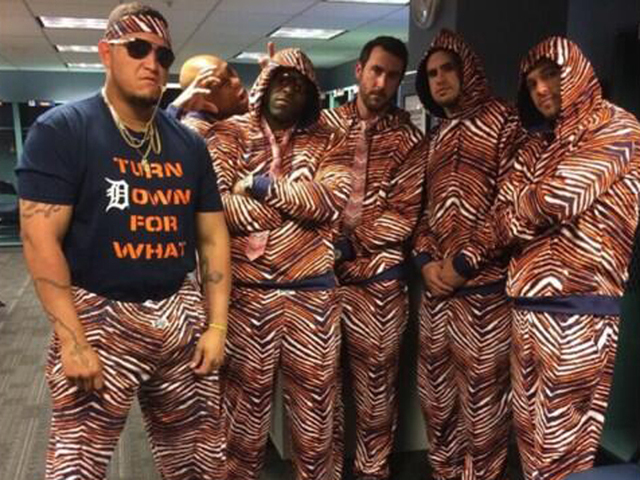 The 2015 Team Previews roll onward today with the Detroit Tigers. This preview is written by our good buddy Corey – lifelong Tigers fan and die-hard baseball fan. If you’re like us, follow him on twitter. The 2014 Tigers won their fourth straight AL Central division title by winning 90 games in the regular season but unfortunately they didn’t notch any wins in the postseason. After being swept by the Orioles in the ALDS Detroit fans hung their heads as another World Series title evaded their hopes. A deadline deal brought in another Cy Young winning pitcher in David Price but it proved to be a non-factor as Tigers’ pitchers gave up 21 runs in 3 playoff games. A 20 year championship drought has Dave Dombrowski and crew heading back to the drawing board as they try to put together the pieces to get that trophy back in Motown. CF Anthony Gose was acquired from Toronto to fill the CF void left after Austin Jackson was dealt during last years trade deadline. Yoenis Cespedes acquired from the Red Sox for SP Rick Porcello. Finally, big Alfredo Simon was acquired from the Reds. With the addition of two SPs and only the loss of Porcello, it became clear the Tigers would not be making a major run at Max Scherzer, who was swept off his feet by the Washington Nationals. A big loss indeed. Those were the big roster moves that have altered the roster but I can’t move on without saying a sad little goodbye to utility man Don Kelly. After 6 years with the Tigers, dancin’ Don has taken his talents to South Beach. Thank you for your service Don. So here we are in March and the games have begun down in Lakeland, FL. A new season is upon us and hope springs eternal. Let’s take a look at what Detroit will be running out on the diamond this year. The beef of the Tigers’ lineup returns for another season. Miguel Cabrera had a down year when it comes to power but he played for quite awhile on one leg essentially. After the season it was found that he had bone spurs in his ankle and a fracture in his foot. Miggy didn’t come out of the lineup though, he just went out there everyday and hit .379 with 8 homers in September and October. The guy is a true horse and as he regains form after offseason surgery, I expect him to return to his .320-35-115+ type year. Victor Martinez had himself an MVP type year at the age of 35 with a .335 avg and 32 home runs. This guy can flat out hit and although he’s missing spring training after a knee injury, I expect him ready for the season to hold down that clean up spot. I don’t think anyone can expect a repeat of last year but you can pretty much guarantee a .300 average. 2014 brought us breakout player J.D. Martinez, a guy who put it all together last year. He still strikes out too much but he provides nice power in the lineup whether he’s hitting 5th or 6th. He’s another guy unlikely to match last season’s .315 average but I believe he can push .280 with another 20+ homers. The exciting addition mentioned earlier is OF Yoenis Cespedes. The Cuban is coming off a 100 RBI season he split between Oakland and Boston and gives the Tigers another big bat in the middle of the order. More so than the longballs, I’m excited to see him unleash that cannon in LF. While I was 50/50 on the deal that sent Porcello packing, I know Cespedes will bring some excitement to Detroit that will be fun to watch. 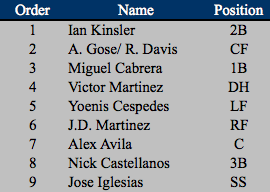 Ian Kinsler isn’t your prototypical leadoff hitter but he brings consistency to the lineup and a good glove at 2B. With only a 4.0% BB% and .307 OBP, you’d like to see a little more patience from him. Even so, Kinsler crossed the plate 100 times last year and drove in 92 runs, you can’t argue with those numbers. The CF platoon of Anthony Gose and Rajai Davis will be about the only source of speed on this Tigers squad. Gose hasn’t proved he can hit much at the major league level but he plays a good CF and with his speed he will fit in well in spacious Comerica Park. Watching him run around the bases and put pressure on the defense in spring training already has me excited for that aspect of his game. Rajai should continue to do what he’s done most of his career which is hit around .270 and steal 30 bases, pretty valuable for a 4th outfielder and he should see most of the starts against LHP. The bottom of the lineup consists of Nick Castellanos, Alex Avila and Jose Iglesias. Castellanos might not ever be the hitter some expected and I’m unsure if he’ll ever crack 20 home runs. I think he’s a solid player though that should hit around .275 with a home run total in the 15-18 range. Oft-injured Avila is back for another year behind the dish. Avila has an average that has been sinking closer to the mendoza line but his .340 OBP against RHP actually has his name up for consideration to bat in the second spot of the order. Seems strange but I’ll take a .340 OBP from someone batting ahead of Miggy, V-Mart and company. SS Jose Iglesias returns this season and it’ll be a nice to see him flashing the leather out there again. The Tigers will boast a pretty great defense up the middle of the diamond this year with Iglesias, Kinsler and Gose. This is something they will need to help make up for the loss of Scherzer and Porcello. I think this is repeat of last season but my biggest concern with this team is the lack of depth. I expect them to finish near the league lead in runs scored again but if injuries creep in, then this lineup could be in trouble. Right now the reserves are Bryan Holaday, Hernan Perez, Andrew Romine, Tyler Collins and platoon of Gose/Davis. You’re probably asking who most of those guys are and I don’t blame you. Sadly, there isn’t much help from down on the farm that can make an impact in 2015 either. This is where things get interesting. The Tigers rotation was a strong point in 2014 and now they are left with a few question marks. Scherzer was not re-signed and Porcello was dealt and now Alfredo Simon and Shane Greene hold down the final two spots of the rotation. Beyond the obvious downgrade in those two spots, Justin Verlander has seen his numbers take a stumble from his Cy Young days and Anibal Sanchez always seems like he’s a pitch away from re-injuring his shoulder. Early reports out of spring are that Verlander is here to prove critics wrong. He added 20 pounds of muscle in the offseason and is looking to regain the form that made him one of the best in the game. I don’t expect another Cy Young campaign, but I believe in a good rebound here. Even if his stuff isn’t as good, I think JV has the right mind to go out there and pitch to his strengths. David Price is guy no one should really question and he should be a consistent #1 guy for the Tigers in his first full year in Detroit. He’s also playing for a new contract after this season so I expect his best effort for 32 starts. The key to 2015 could rest on the arms of the new 4th and 5th starters Alfredo Simon and Shane Greene. Simon went to the All-Star game but he probably wasn’t as good as his numbers looked. With a K/9 under 6.00 it’s amazing he gets the results he does. Big Pasta must be a tough guy to square up. At worst, he’ll be a good innings eater in Detroit. Shane Greene kind of came out of nowhere for the Yankees last season and the Tigers are putting faith in him to do that again. While he never did anything remarkable in the minors, he came up to the Bronx and struck out 9.27 per 9 and had a 3.78 ERA in 14 starts. He throws hard and has good movement. He gets a lot of groundballs and that improved defense with Iglesias should work in his favor. I like Greene as a sleeper and I think he’ll hold down that 5th spot pretty well. No, those aren’t my thoughts on Joe Nathan. That quote is from me in my 2014 Tigers team preview and I’m a little embarrassed by it. I got a chuckle from it now because I know the Tigers bullpen will be another dumpster fire in 2015. Nathan certainly didn’t bring upon any comfort in that closer position and I don’t foresee his fortune getting any better this year. The Tigers bullpen continues to be a disappointment year after year. It seems more of a curse now that not even Mariano Rivera could revive. Joaquim Soria, Al Alburquerque and Joba Chamberlain will be sharing late inning roles and none of them were awful last year. Al ABQ actually had a 2.51 ERA last year which surprised even myself when reviewing the season. This isn’t the Royals bullpen, but these three are capable relief pitchers. Tom Gorzelanny was added in the offseason and he should be a dependable lefty even if he doesn’t have overpowering stuff. I’ve said more positive stuff about this bullpen than I would have expected but it still isn’t a group that strikes fear in opposing hitters’ eyes. The truth is, if Joe Nathan has another ERA approaching 5, then things are going to turn ugly and the Tigers will be forced to look elsewhere. Maybe this is the year we finally get to see Bruce Rondon stay healthy and show that 100 mph gas. He’s the guy I’d love to see out there at the end of games but I’m not getting my hopes up just yet. I hate to say it, but I’m picking the Cleveland Indians to win the division this year in what should be a dog fight between everyone outside of the rebuilding Twins. I know the Tigers are capable of another AL Central title but the pitching really scares me this year. People are starting to say the Tigers are on their way to the current state of the Phillies. With the lack of a farm system and an aging roster full of big contracts I can see their point. The depth really is a concern and the Tigers desperately need an infusion of young talent in their organization. Even so, I trust Dave Dombrowski a lot and I think he’ll continue giving the fans of Detroit a roster capable of making postseason runs. Friendly and helpful customer support representatives who are ready direct you to your personal research paper writer to clarify any issue for you. Convenient system of communication including online chat, phone, skype, email, etc.